Big decision, but as you said, you are coming home...Home is where you make it, and after travelling around, and living on the other side of the world, it makes you realize how close we really are! I imagine you have had some wonderful experiences living OS, but I am sure that coming home will be oh so bittersweet. Have you read Nikki Gemmell's book "Why you are Australian? A letter to my children?" It is a great read and will probably strike a chord with you. I believe she is now back living in Sydney after years away living in the UK. Looking forward to reading about your move. that's exciting! are you ready for the heat.. so hot and humid in sydney today. all the best with the move.. we have moved a lot, within the state though. it has made our kids very flexible. you are all lucky to have had the experience. I know what that feeling's like. There was a little tear in my eye as I read that. Goodbyes and hellos...love and wonder and beauty in them both. Huge news! Of course I'm giddy with excitement and can't wait to do an actual coffee with you and the kiddos rather than a virtual one:) You sound very calm about this decision and I'm so glad that it feels right to you both. Vicki Archer of French Essence writes beautifully about having a heart that belongs equally in two countries...a feeling I guess you're a little used to by now. I think I might just pretend (for a while at least) that you are still "up north" just so you feel close by. On a serious note though, I know that you have all loved and appreciated your time in England and that all that matters is that your family of five are together....home truly is wherever you are, you will always see to that....that's why you're so special. I can absolutely appreciate the difficulty of the decision you have made - which must be even greater when you have a family to consider. To be honest, I think for me it always came down to where does my heart feel that I need to be 'now' - what feels right...Your children will have had the most amazing experience with the opportunity to live abroad, and I think it will make all of your family's enjoyment of picking up your lives again in Australis so much the richer. Oh a Momentous decision. I bet your family at home is ecstatic. I hope you bring back heaps of your English goodies. I think the packing and relocating will provide you with plenty of blog fodder. big times ahead, you know I've got your back, if you need something from this side of the world, just yell and it will be send to the beaches, no problem! 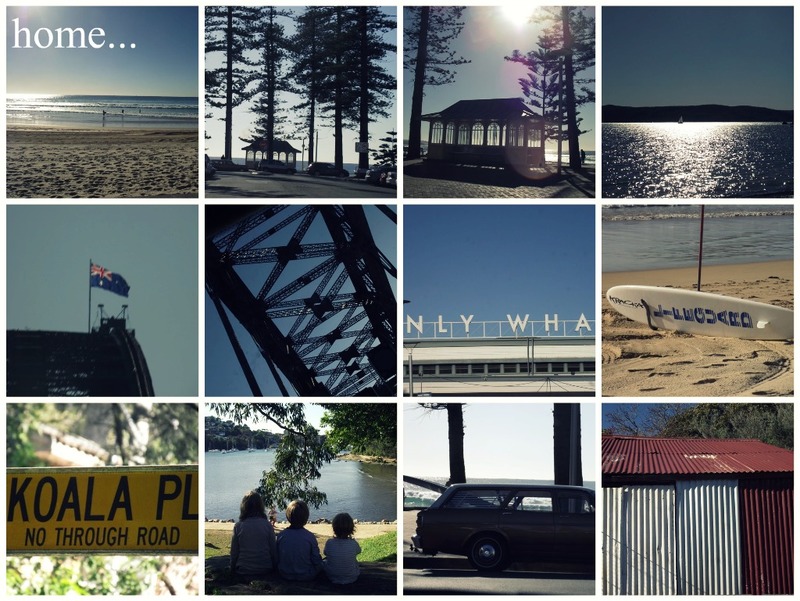 And the photo's of your life in Oz are sooooo cool! You know how I love me some beach, so I look forward to Miss Sew and Co reporting back to us with sunshine in those gorgeous photo's. Melissa I have no doubt that this was just as much a heart wrenching decision to make as it was when you first contemplated the move to the UK four years ago. But I can see that , hard as the reality of leaving so much behind is, you really do seem ready to go home. I bet those lists are long! You'll be busy checking you have enough chippy chairs and milk bottles , and I'm sure there must be time for another few boot sales with your BB. Something to sustain you both until she visits you in Sydney. Big news Melissa, but how wonderful that you can return home knowing that you made the most of every minute here in Europe! Safe journey, and we'll just pick up on Miss S&S when you're back down under!! So exciting that you are going home. Best wishes for all the details. Looking forward to learning and seeing much of Australia through your beautiful posts...just as I came to love your English countryside, I know I will long to visit Australia next! Your Sydney mosaic is fabulous. All I can say is welcome home in advance. I will be great to have yet another blogger on the beaches. Sorry that should have been 'It will be great'...and it will!!!! I am thrilled for you to be coming home - it is hot now (well in Brisbane anyway) but it is really hot. Hi Sweets So glad the news is out now. It must have been weighing on your mind a little - you've had so many people to tell and let them digest it in the last little while. I, too, will really miss your take on English country life. So unbelievably much. Oh Melissa, there must be such a turmoil of emotions going on right now. I sort of sensed that this news was coming...can't pin point why, just a sense. From following your adventures here for a while I can truly say that it feels like you have made the most of each and every moment. You've embraced all the good things and the positives of Emglish country life...(and I'm sure seen some not so great things.) Your writing has been insightful, sharing and inspiring, and as much as I will really miss those glimpses of England I'm also looking forward to sharing the stories of your new chapter back in Australia. I know I've probably said it before but the experiences and adventures that you shared with your family will be treasured. Your kiddos will became sandy, salty and sun kissed again! I thought this would be coming soon...but wow, that was soon! I am happy for you and your family and a little stressed for you just thinking about all you must have to do to move back to another country! wow. I will really miss all of your adventures in the English countryside but I look forward to following you back to Oz now ; ) Can't wait to see how your new life unfolds right here on your little blog. Melissa- you are truly an inspiration for so many of us. I just don't know that I could do what you have done so I admire you all the more that you were able to take your family on this marvelous adventure. Much love to you, friend! Oh Sweetheart...a rollercoaster ride of emotions indeed...but what an amazing journey you and your little family have had..what amazing friends, memories to have made and keep forever. I suppose the only consolation is that your not travelling from a place of beauty..to a place of despair. Sydney is still ever so glorious as you have seen in your previous visits...and you have SO MANY wonderful welcoming arms ready to give you a big rib crushing hug when you return. Summer is beautiful here...and how wonderful for your little munchkins that they will get to experience all that beautiful Sydney has to offer. So many adventures created in their little hearts already..and this is what they will remember and pass onto their children. Keep safe my friend...be happy and positive as you always have done...all is well in your world and will always be so long as you are always together as a family..and you know you have such a huge network of supportive and encouraging friends to help you through it.